Premier-quality range rounds from one of the world's most prestigious and oldest makers. Sellier & Bellot FMJ Ammo strikes the right balance of performance and price. That's probably why Sellier & Bellot FMJ Ammo is our best-selling ammo. 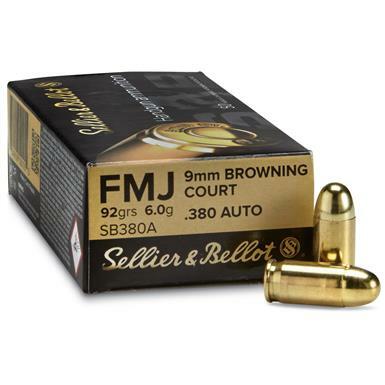 Sellier Bellot, .380 ACP, FMJ, 92 Grain, 50 Rounds is rated 4.7 out of 5 by 96. Rated 5 out of 5 by Sunnybouy from target ammo Great target and practice ammo. No failures to fire, feed , or eject. Rated 5 out of 5 by Ken M from Great ammo! S&B ammo hasn't failed me yet. Just shot off 100 rounds of this .380 and as expected, not a single problem. Also purchased S&B in .40 and .45 from the guide and not a problem with those either. Great ammo, if you never tried it before, don't be afraid. You will be happy with it! Rated 5 out of 5 by Notonmywatch from Great Ammo, prefered product. Love the S & B ammo in all calibers , it's my preferred choice. Clean well made and nicely packaged. Rated 5 out of 5 by Jimm from Great product! Great product at a reasonable price. Clean accurate ammo no fouls with my P238 with the entire box. Fast shipping. Rated 5 out of 5 by the omer from Good Ammo I have only fed 200 rounds through my Sig P238 works fine but after running 100 rounds it did seam a little dirtier than the actual Sig Ammo but not enough to really gripe especially when the price is taken into account. Rated 5 out of 5 by leef from Excellent ammo and service My CC Kahr 380 is a nice handgun but very ammo selective. I found that Sellier & Bellot is a very reliable ammo for it. Also B/S ammo is my choice for my 9mm handguns. Clean and reliable ammo at a good price. Rated 5 out of 5 by TwoTon from Great value!! I'm a huge fan of Sellier & Bellot ammo, as they are consistently the most trouble free with my Glock 42. They feed perfectly, are extremely accurate, and I've never had a dud or partial fire. For the money, they are perfect for the range, and even as a primary self defense round.